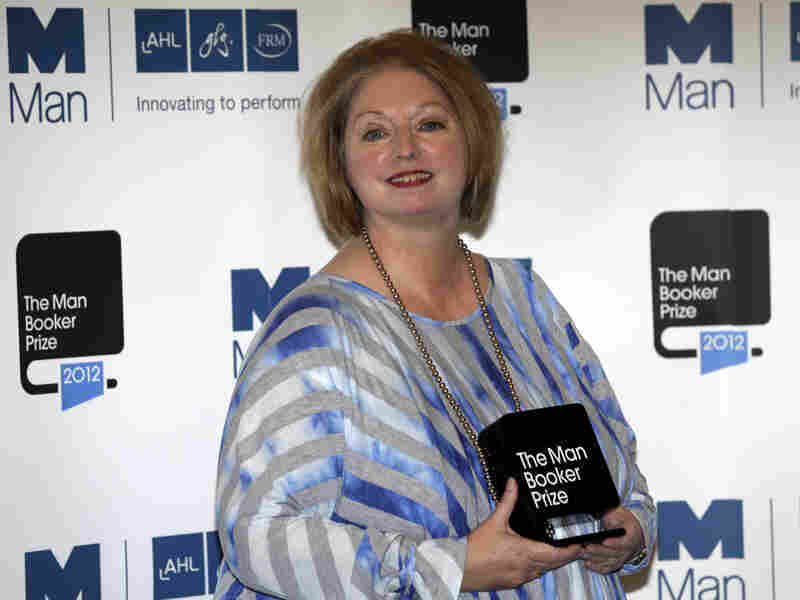 Hilary Mantel Wins Man Booker Prize For 'Bring Up The Bodies' : The Two-Way The British writer becomes only the third author to win the prestigious award twice, joining J.M. Coetzee and Peter Carey. She also becomes the first author to win with a sequel. Her novel Wolf Hall won in 2009. Hilary Mantel, winner of the Man Booker Prize for Fiction, poses with her prize shortly after the award ceremony in London Tuesday. Mantel, won the 50,000 British pounds (approximately $80,000) prize with her book Bring up the Bodies. "The whittling has finished," declared the website of the Man Booker Prize. On Tuesday, judges awarded the prestigious literary award to Hilary Mantel for her historical novel Bring up the Bodies. The British writer thus becomes only the third author to win the award twice, joining J.M. Coetzee and Peter Carey. She also becomes the first author to win with a sequel. Her novel Wolf Hall won in 2009. The two novels are part of a planned trilogy about Thomas Cromwell, an adviser to King Henry VIII. The third book, The Mirror and the Light, will continue the story until Cromwell's execution in 1540. "This double accolade is uniquely deserved," said Sir Peter Stothard, chairman of the judges. "Hilary Mantel has rewritten the rules for historical fiction." "Her resuscitation of Thomas Crowell – and with him the historical novel – is one of the great achievements of modern literature. There is the last volume of her trilogy still to come so her Man Booker tale may yet have a further chapter." Receiving the 50,000 pound award (approximately $80,000) in London, Mantel said, "You wait 20 years for a Booker Prize and two come along at once." "Yann Martel's Life of Pi, which won in 2002, made just under £10m. Last year's winner, Julian Barnes's The Sense of an Ending, has sold 300,000 copies so far. According to the latest figures, Mantel's Bring up the Bodies has sold 108,342 copies, which is more than the other 11 Man Booker longlisted novels combined." The other novels short-listed for the award were: Tan Twan Eng, The Garden of Evening Mists; Deborah Levy, Swimming Home; Alison Moore, Will Self, Umbrella; and Jeet Thayil, Narcopolis.